I first found Sequin jewelry while perusing around Nordstrom. Not going to the lie, the name kind of drew me in! I hadn’t heard much about the brand, but boy did I love their jewelry. I started with a necklace and slowly started adding bangles to my collection. When I moved to Chicago last year I was pleasantly surprised to find a Sequin store in my neighborhood, Lincoln Park! That’s when things got ugly insanely gorgeous. I became obsessed. It wasn’t a little crush anymore, I was head over heels! Sequin has your on-trend pieces, as well as your classics. 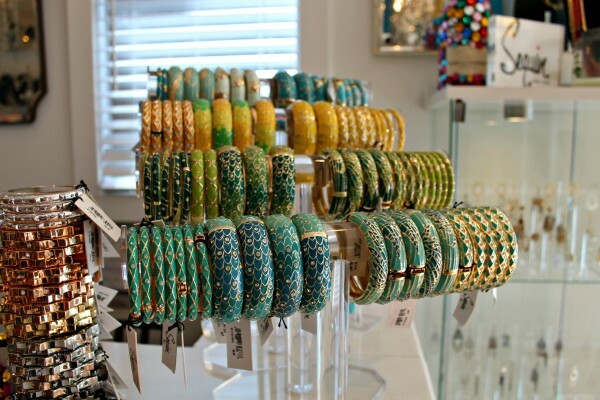 The seriously cute store has bangles upon bangles upon bangles. 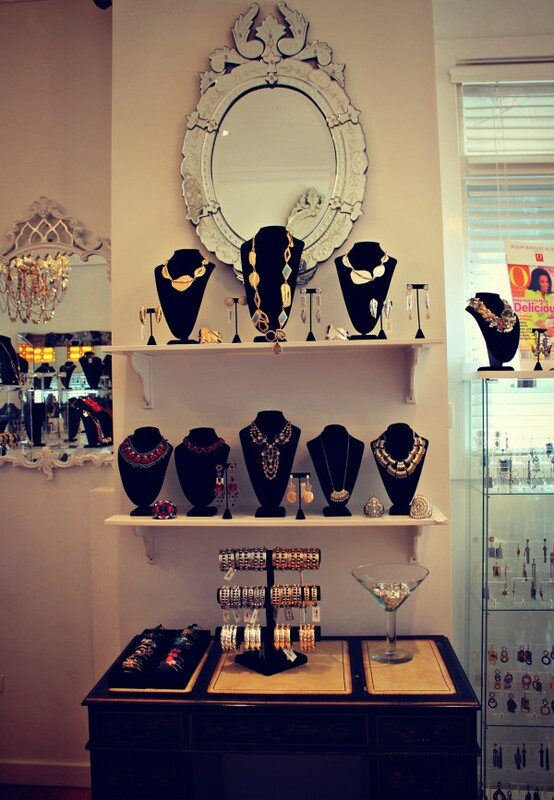 And then some amazing earrings, beautiful bracelets, and bold statement necklaces! 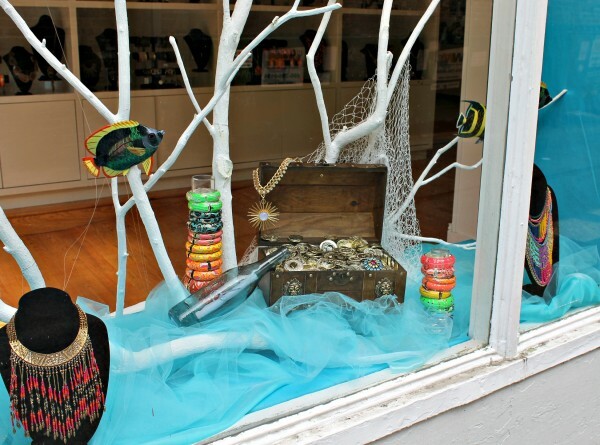 Let’s not even talk about how fun the jewelry displays are… I could spend hours in this store. The Sequin girls make bauble browsing more fun that it already is! Want to know my favorite part? Pieces start in the $20’s! Now that I have you lusting over jewels… the generous gals at Sequin have given me three bangles to give to one lucky reader! 1. Head on over to the Sequin Facebook page and “Like” them! Feel free to follow along on Twitter as well. They are constantly doing giveaways on both Facebook and Twitter! 2. Leave one comment below telling me about your jewelry style. Are you a “more is more is more” kind of girl? Or do you prefer wearing one piece at a time? Do you tend to buy trendy jewelry or do you stick with the classics? 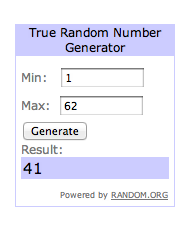 UPDATE: Winner of the bangle giveaway is Diana! I’ll be emailing you soon! i love to layer bangles and random bracelets, but when it comes to necklaces i like to wear only one delicate or bold piece! But layering bracelets is my favorite! Love jewelry!! I love big statement necklaces. I also like the new trend of stacking a lot of bracelets. And like you, I like sequins and shine 🙂 Usually I have one “area” of jewelry, either bracelets, necklaces, or earrings. I let those pieces shine and wear understated for the others… Great giveaway! I liked and followed! I love to stick to the classics but I do love changing it up every once in a while and adding some good statement pieces! I also do love wearing a lot of bracelets with my watch (especially colorful bracelets)! This is such a great giveaway! At first, I hated watches & bracelets because they always got in the way, but something changed. Now, I love lots of bangles and have a gorgeous gold MK watch. I love J.Crew bracelets! They are of good quality! I’m definitely a more is more is more girl! I love pairing all kinds of braclets and bangles together and these gorgeous bagels would go with my collection! I have like on Facebook. I tend to be a minimalist but somedays spring for multiple pieces! A staple is a big watch and necklace but sometimes piling on bracelets and bangles. Whatever fits the mood! For me, it all depends on my mood or where I am going! Sometimes I keep it simple with a watch & a classic bracelet/necklace/earring combo, and other times I love to layer my trendy bracelets and bangles. My jewelry style is kind of less is more but some days you just go all out 🙂 I love a simple outfit with lots of bangles and maybe a statement necklace. I “Like” on FB and am following on Twitter! I’m obsessed with my jewels…to me whether it’s a stack of bangles or layered necklaces, it’s important to have fun with it! The arm party is one of my favorite parts of getting ready! It’s just another great way of letting one’s own personality shine through 🙂 This is such a fun collaboration! I love you and I love Sequin! Following Sequin on facebook and twitter. My jewelry style tend to vary depending on the day and my mood, but I generally go with more is more! 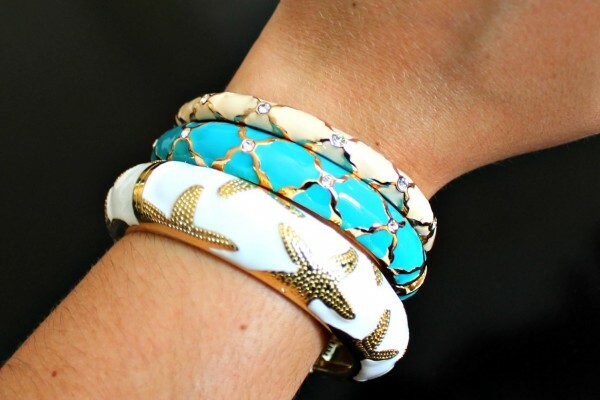 I love mixing bangles in all different colors and textures for a very individualized look. I find jewelry so much fun to play with! I typically am a less is more kind of girl, but when it comes t0 bangles I can’t help but stack them up! I “like” Sequin on Facebook. My jewelry style is pretty classic as I like to focus on one special piece at a time. I like to buy trendy pieces sometimes too just to change things up a little. These bangles would look great worn separately or all together. Great giveaway! I really just look on my dresser and grab what I think looks good with the outfit I have on. I am a “no rule” type of gal when it come to accessories! 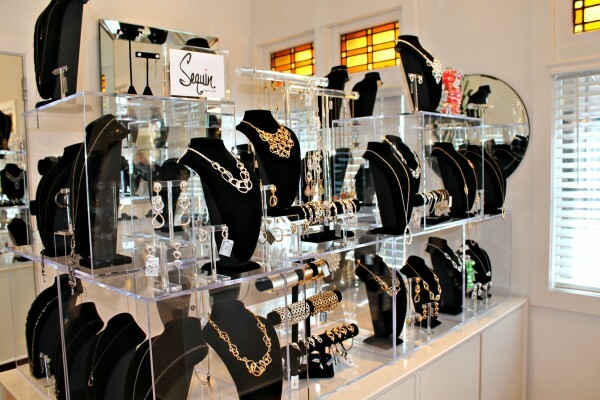 I love lots of jewlery! But lately I only wear my intial neckless and a arm party of bangles with my Micheal Kors watch! I love layering my bangles and necklaces I wear one at a time. However I’ve come to realize I don’t have many rules with jewelry. I just ordered two Sequin bangles last week (The leopard print one you have!) and another one that is out of stock now. Sooooo glad I did! walking over to Armitage as we speak….kidding but do looooovee me some arm party. oh, and I’m totally into classics. P.s. 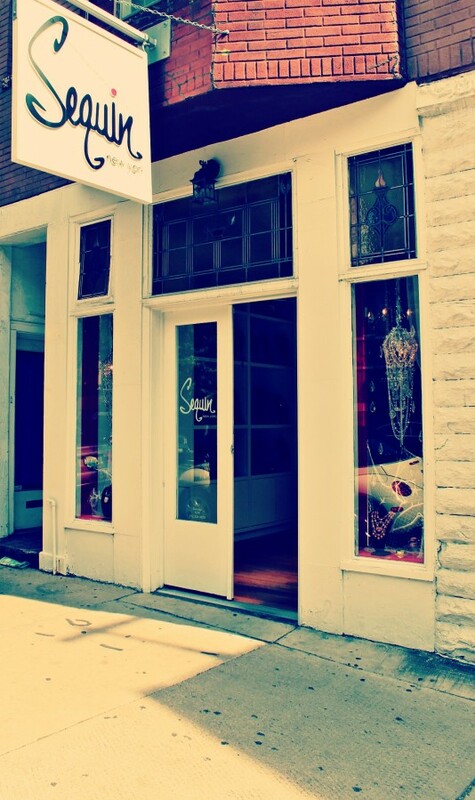 have you checked out Shop 857 just down the street? I love and know you will too! I usually wear one at a time and sometimes more then one if i find it necessary. I probably stick to classics but I have some not so classic bracelets. I love the layering look – I always have to have at least 2 or 3 bracelets on before I head out the door! Love the bracelets! I’m more of a wear a couple of pieces at the time kind of girl- I love the layering look, but usually I only wear a few pieces at a time. I love stacking up! the more, the better!! I am totally a more on more on more girl! Never enough sparkle!! I’ve loved jewelry since I was a little girl and discovered my Mom’s jewelry box. On rainy days I’d ask her to pull it out so I could try on all the pieces and pretend I was going to a fabulous party. Sometimes I’d just pick up a necklace or earrings and stare at them in stupified awe. Now I have my own jewelry armoire filled with everything from dainty diamond studs to bold bangles. I pretty much love it all but I’m particularly obsessed with bracelets. 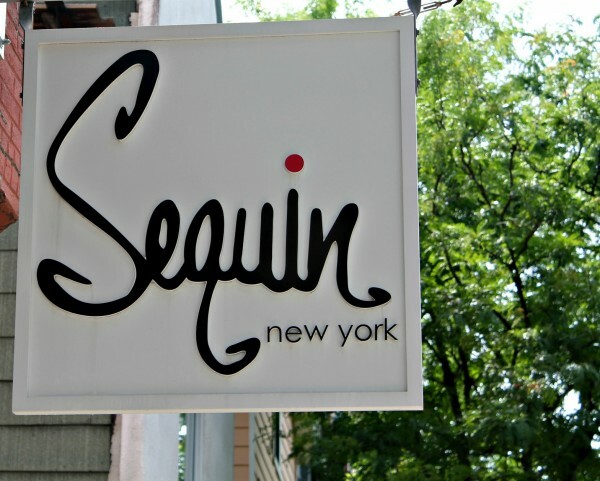 Can’t wait to check out Sequin! I’m a recent convert to wearing more accessories on my wrist! I used to be a single-bracelet type of girl, but now I’m trying to wear at least two when an outfit needs some *sparkle*. I’ve started collecting some “arm candy” but could definitely use those bracelets to add to my statement pieces! I also “Liked” and followed Sequin! The bigger, and brighter, the better! I love mixing trendy and classic pieces, as well as mixing genres! 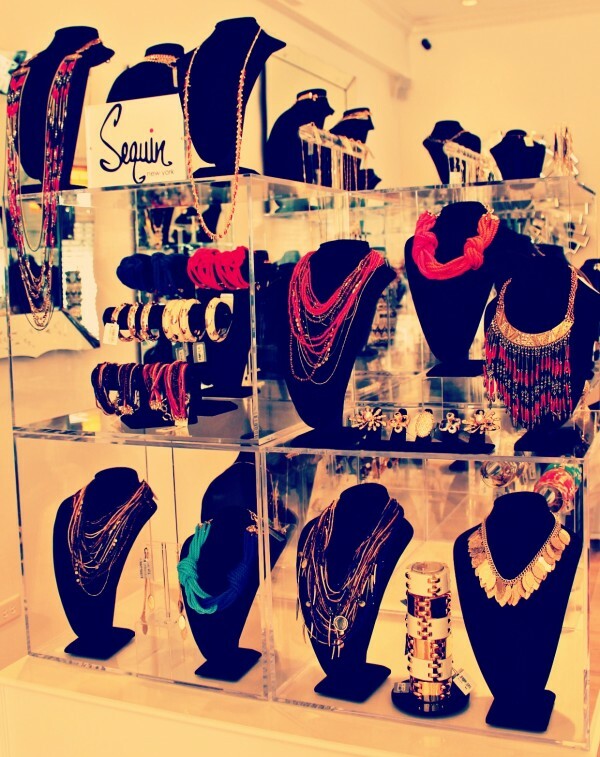 I also follow Sequin on Twitter and “like” their FB page! I am more of a one piece at a time type of girl and go through both trendy and classic phases. What an amazing giveaway. Looking forward to more of this spotlight feature. I almost always wear only one necklace daily, but love to pile on the bracelets, especially colorful, bold pieces like those pictured above. I love this new feature! Am definately going to be doing some browsing on Sequin later tonight..Thanks Jessica! I love your blog and your style. I liked Sequin’s Facebook page. I guess I am a one piece at a time kind of girl, usually. I wear one bangle on one wrist, and another bangle on the other wrist, but sometimes wear a couple on one wrist, too! I like both trendy and classic pieces. 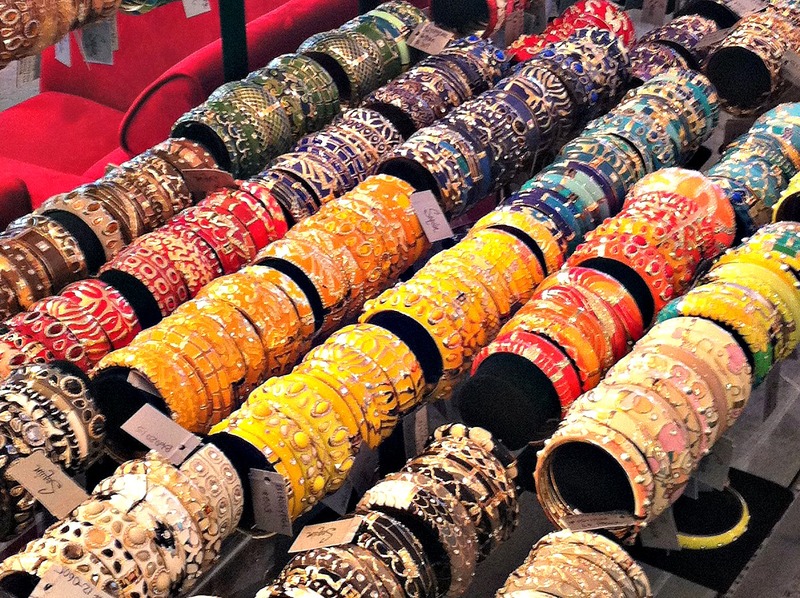 My favorites are bangles, I am obsessed with them! Thanks for the chance to win those amazing bangles! Loved this post! I usually try to add one statement piece and keep the rest pretty dainty. Gorgeous stuff! I am a statement necklace and statement ring and simple studs and bangles kinda girl. I’ve gotten a lot of jewelry inspiration from your posts. I’m absolutely IN LOVEEEE with your gold bow Kate spade ring. Just can’t make myself spend $78 on it. Haha! I’m pretty sure I have one of their bangles from Nordstrom. So adorable. LOVE LOVE LOVE to have lots of “arm candy”!! LOVE having a party on my arm! A big fan of statement necklaces too! More is ALWAYS BETTER!! I’m usually one piece at a time kind of girl but I’m really loving the new arm party trend!! Trying to find more pieces that look good paired together. I love mine classic jewelry but when I go out I need a trendy statement piece. I think I’m kind of a mix of everything it all depends where I’m going for the day. Loving these bangles that could be part of my arm party!! I tend to wear one big statement piece with a few complimentary small accessories. Fun, loving this new segment…only wish I was closer to visit this fabulous store! I am a more is more is more kinda girl!! I love mixing old jewelry with the new trends. My grandfathers watch with the newest bracelets stacked on top is one of my favorites! Sequin jewelry is absolutely adorable, and I always eye them when working at Nordstrom. For Christmas this past year, Jessica gave me my first bangle from Sequin and when I’m feeling like stepping out of my comfort zone I love to wear it. However, my normal jewelry routine is to wear a gift my mom gave me. When I turned 18 my mom gave me a pair of diamond stud earrings for my Birthday, and when I graduated from high school a few months later my mom gave me a matching diamond necklace. They are very simple, but beautiful and I always wear just that. On occasion I will throw on a Michael Kors watch, or if I buy a new ring I will wear it with painted nails! I am not opposed to dressing up my jewelry routine, but it certainly does not come naturally! I love jewlery because its like shoes…undiscriminating. Even trends pieces don’t really go out of style and you don’t have to ‘recycle’ them. I tend to wear less jewlery now b/c I’m a little older and have put on a TON of weight so I’m not comfortable being too flashy, but I feeel naked without anything on. I just found your blog and think the bows & sequin theme is adorable and I like that you’re not just trying to be as weird as possible like so many other bloggers. I like the weird stuff, obviously, but I want a break sometimes. You are refreshing. ‘Liked’ them and also following on Twitter 😀 Those bangles are adorable. I checked out their website and want all of the ‘Bali’ collection, so cute! When it comes to jewelry I love piling on bracelets. Before reading your blog I think my jewelry style was more toned down, but you have convinced me to try some bright, bold pieces, and I love it! liked & followed! i’m a more is more girl especially with bracelets. i love to wear a gold or silver watch and match my bracelets and rings accordingly. i do have days when a watch and a single bangle do the trick as well. as for necklaces, i like simple pieces — long and short. Liked & Followed! I love chucky for sure! But I do have my classic go to pieces that I keep in rotation and I do always love to add in a new bold colorful piece! I’m one extreme or the other with jewelry. Sometimes I’ll wear 6 bracelet or none. Seldom something in between. Following! Besides my staples, a watch and pearl earrings, I usually do either an arm-full of bangles or a statement necklace. I love layering jewelry, especially bracelets. I usually go for one statement piece within the layers. Would love one of the bright coral enamel bracelets to layer with skinny gold bangles! When it comes to jewelry, I’m more of the type to mix more expensive, designer pieces with less expensives, sometimes trendy, sometimes street sale finds. Like clothing, I feel like you should have a mix of old and new in your jewelry. 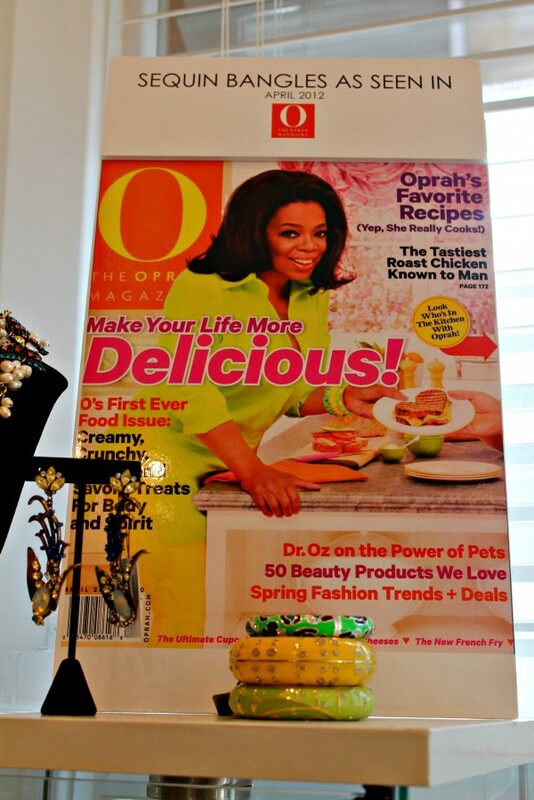 I also like to display my jewelry on a stand like you would find at a boutique. It makes me feel like I am shopping my closet each time I get ready! Hey Jessica! 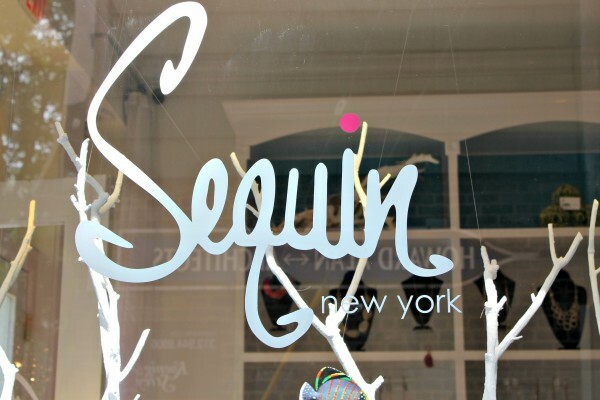 I liked and followed Sequin on fb and twitter! I’ve always noticed them in Nordstrom, too, but for some reason I never picked them up! 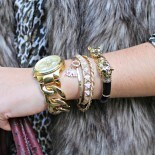 When I’m going out with girlfriends or just running around I’m totally an arm party girl, love to stack. On date nights with my love I try to keep it more simple and refined. I feel like this pieces are so versatile, though, that even for a date I could use one of the thinner bangles and then for those arm party days this combination is perfect! Thanks for the giveaway! I’ve always been a necklace girl since I was very little (even all my class pictures show me wearing a necklace starting age 9). I just love how versatile they are. You can have that small charm necklace that goes with everything, something like a background character in your fashion story. Or you can have the statement necklace that takes over your entire outfit and draws your eyes from 15 feet away. And then theres everything in between. Plus what a great place for a woman’s body, right near her decolletage! 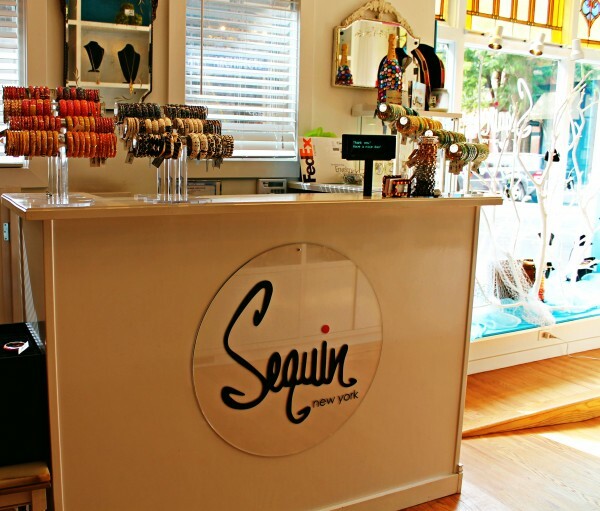 love sequin, and this store! like them on fb! i always feel more is more better! the brighter, the sparklier, the better! i’d love to add these to my growing collection of arm party arsenal! Like and love following both sequins and jessica!! I’m being inspired to try more is more and my favorite is the arm party style with bangles, braclets, and a watch! 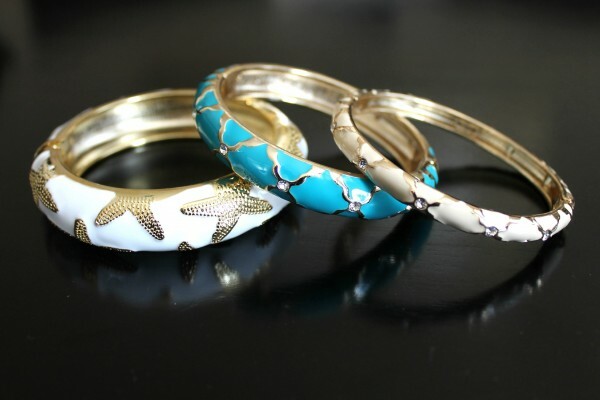 Love the starfish and turquoise theme in the three bangles above! !